They begin their lives by falling out of the sky. Plummeting down with increasing velocity, gathering momentum, the freezing wind whistles past a lemming’s tiny ears until at last, he (or she) lands on the snowy wastes of the arctic to begin their little four-legged existence. And they land, and lo, there are about ten thousand lemmings living in instant harmony. Paralemmings, if you will. Except that no-one ever sees where they came from. They arrive mysteriously, as if from some great silent airship lemming carrier in the sky. My source for this early piece of ecology (coined, cybermyth has it, in 1530) is sketchy. It is said to come from Zeigler of Strasbourg, who was a geographer at the time, states ABC news. I can find no trace of him or his lemming- based text: this makes me sad. I want to read more of his theories. He said lemmings would fall down in stormy weather and then, as the first blades of grass pushed through in the Arctic Spring, the vast majority of them would simply shuffle off this mortal coil. No, no, no, said Olaus Wormius (1558-1665), the improbably named physician and antiquary: you’ve got it all wrong. You can’t just have lemmings falling unaccountably from the sky. They must have been blown there. It is the wind, Worm expounded, which brings tens of thousands of lemmings to one place at one time all at once. There are holes in these theories, given. They’re not perfect. But why theorise in the first place? It is simple. Lemmings beggar belief: for how can there be so many one minute, and so few the next? It’s now-you-see-them-now-you-don’t. One minute, there are thousands upon thousands of lemmings in a given habitat. The next, they are a sparse little group huddling together against the Arctic cold, watching the first blades of grass grow. And this has puzzled man ever since they stopped contemplating their ancient navels and started watching lemmings. The scientists have worked out what really happens now: but not before Walt Disney got hold of them and maligned them so thoroughly that they have entered popular culture as little suicides. In the 1920s, Charles Elton chronicled the puzzled Norwegians, observing lemmings in their thousands plunge into the sea. He put it down to migration. He coined the phrase The Lemming Cycle, and began to look at how you could use mathematics to express the rises and falls of the critters’ population. Lemmings reproduce very quickly: and when their population becomes too dense, they migrate elsewhere. A short Summer and a long winter tend to result in population explosion, scientists have since found, thus every three or four years it happens. They can swim; water holds no fear for them. But sometimes they choose a stretch of water that is just too wide, and they are conquered by the waves forever. They are not little suicides. Walt Disney, however, branded them such. White Wilderness is a 1958 documentary film produced as part of Disney’s True Life Adventure series. It shows our small furry friends plunging off a cliff into waters and their doom. 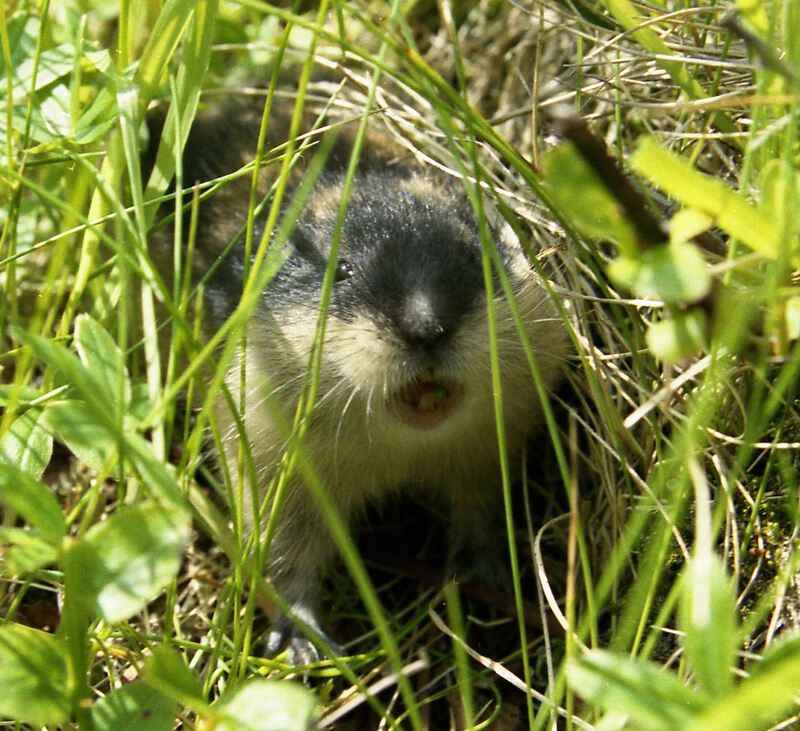 But in a 1983 investigation by the Canadian Broadcasting Corporation, it was revealed that Disney staff purchased a large quantity of lemmings from Inuit children, and shipped them to Alberta for a photo shoot. They used careful editing and camera angles and positioned a lazy susan at the top of the cliff: a snow-covered turntable on which the little creatures ran. So, almost 500 years after the first tall tales about lemmings, where they come from and where they go to, they are still fuelling improbable theories. But the little creatures can put their parachutes away, and screw up those little suicide notes. The scientists are on the case. Because we know now: it’s just a migration game. Those who survive? They’ll be back with the first Winter storm. I’m still unclear about the rain of lemmings and whether I should be watching out for it. There does seem to be a lot of failing in their mythology. Me: if I went to the antarctic approaching wintertime, I’d take an umbrella, Roger. There’s a new saying for us both 😀 Thanks, Julie! Love this post, Kate. Olaus Wormius sounds like a fascinating character, and his theory wasn’t all that far out when you think of it raining frogs (or cats and dogs in recent times!) but I love the mystery of the lemmings. I think we should have a few things that remain unknown! I never entertained the idea of taking Wormius seriously, Tom: you have reminded me it is important to keep an open mind…. Walt Disney deceived us with a lazy susan? That’s as bad as finding out there’s no Tooth Fairy. Still, I’m glad to know little lemmings are not suicidal. Great information and done in a delightful way. Thanks, Jennifer 🙂 Yes: Walt was the general when the minions were propelling lemmings of cliffs with lazy susans. It is difficult to get that image out of one’s mind…. Animal cruelty, plain and simple. Walt, my opinion of thee hath plummeted 😦 And now that awful vision will stick with me, too. Oh, Oh, now I have to do a thorough study of the “Real” origins of Mickey and Minnie….perhaps they aren’t really who i thought they were. EGADS!!! Quite! If Walk can lazy susan a lemming, what could he be doing to mice??? Thanks, Carrie. Writing teaches me, too, as I go along. It can be great fin. Lovely piece Kate and truly, I’ve never given it much thought beyond Disney. Thank you. Thank Sidey, Tammy: I always marvel at where her themes lead us all! That game can can be impossibly moreish, can’t it, Cameron? If we can’t put our faith in Disney, where can we put it??? We may as well follow the lemmings off the nearest cliff . . .
😀 I think you should restrict migration to the odd holiday, Nancy. I couldn’t do without my SLTW fix. I was relieved when I first learned, several years ago, that they don’t, in fact, commit suicide. But it’s still a shame that they inadvertently die when they’re migrating. That makes me so sad. But they’re really cute little things. It is sad that so many die, but the scientists seem to think it is nature’s way of controlling the population. Sad, though, as you say. I saw every Disney film back in those days, especially the nature films. I’ll bet anything that’s where I got the idea that lemmings do march to the sea and commit suicide en masse. Another childhood fantasy laid to rest. Shame on Disney for perpetrating it. Indeed. And with such calculating callousness! Ah, Walt, the things he gave us and the things he messed up for us. Oh well, we have you to set us straight, and that you did so very well with this wondrous post. Go lemmings. Go lemmings, indeed, Penny! Hope all is well with the tribe on and off the Cutoff! It does not surprise me that Disney would doctor and sensationalize nature (“little suicides” — oy). They were always too “wonderful world” for me — even when I was a tot, albeit a born cynic. I suspect the lemmings only thought they were in a high-dive competition. They certainly weren’t suicidal. They’re far too happy for that. But, Walt was right about Mickey Mouse and his pals, right? I’m limited on what I can say. My youngest daughter works for Le Mouse. A very short step, Debra, from those that survive to those that don’t. Poor lemmings. they have such a reputation. I did not know it rained lemmings. Thank goodness for your blog. if I were smacked in the head by a furry little creature from the sky, I’d have to assume I’m drunk., and that always puts a real kink in my shopping. Now I know to carry on as usual when I see a flying lemming. I love the information I get here, Kate. I never knew the Disney story, for example. And the first part, the para-lemmings, I so hope its true. Ah, Tinman, if only it were: if only it were. I feel better now about lemmings but worse about Disney. Although as a librarian, I haven’t had much respect for the Disney corporation in a long time. It does open one’s eyes a bit, doesn’t it, Kathy! I was so annoyed with Disney when I discovered that particular legend (which I had swallowed hook, line and sinker and believed implicitly for years) was false that I almost resigned my membership of the Donald Duck Admiration Society. Steady on, Col. That’s going a bit far.